When Mohamed Shetiah moved to East Lansing from his home in Egypt 21 years ago, he didn’t know English, the American culture, or exactly what to expect in the United States. The only thing Shetiah really knew, he said, was that he was coming to the U.S. for opportunities he couldn’t find at home. On Tuesday, Shetiah opened his 20th Biggby Coffee shop at 4480 Hagadorn Road, in Okemos, giving him more than twice as many stores as any other Biggby franchise owner — which he said was another step in his journey to fulfill his dreams. Mohamed: You story makes us all proud. It proves that America remains the land of opportunity. Thank you for sharing it. What a great article. 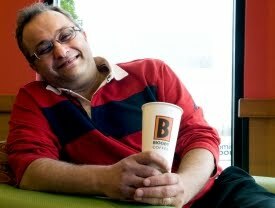 Hurray for another BIGGBY opening this week! Mocha Mocha is my favorite drink! This is a fantastic story! Mohamed, you provide great motivation to me today. Thank you! Congratulations on each one of your twenty stores Mohamed!! You have a very powerful story. Hey Mohammed congrats on the new store! 20 Stores wow!